"My worldview has been reshaped by my experiences at Miami and in Jordan. I have discovered that at the core of myself is someone who wants to make a positive impact on this world, even if it's a small one. I could have just gotten a job in computer technology after high school and would have had a steady job for the rest of my life—but I would've never really known what I was capable of." "When I was in high school I wasn't actually sure I would go to college because it wasn't really in my long-term goals. I was in a two-year information technology program in high school and would have felt lucky to have a steady job for the rest of my life. During my senior year I became interested in religions and cultures and met a recruiter from Miami's Hamilton campus. I started there as a Religion major. I didn't know what I was going to do with this degree, but I felt inspired to follow my heart. I then transferred to the Oxford campus and finished my degree just this past December. "Everyone in the Department of Comparative Religion is really close, and I've made life-long friends with both classmates and teachers. Miami's Arabic program in GRAMELAC [Department of German, Russian, Asian, and Middle Eastern Languages and Cultures] is the same way. I know and get along with everyone." Courtney DeHaas and a friend display the Miami colors in Jordan. 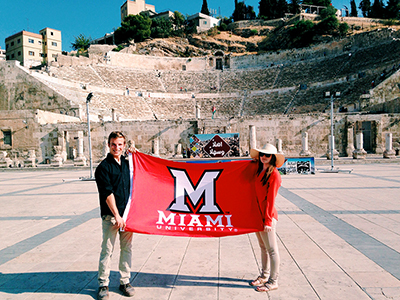 "My best experience at Miami was receiving a Gilman Scholarship to study abroad in Jordan last summer. On top of that, I've also had some really good intellectual discussions with students and faculty, including my involvement in my Altman Undergraduate Fellowship, which I received from Miami's Humanities Center last year. I've had a really good time meeting all of the visiting speakers for the various Distinguished Lectures and getting the opportunity to interview them. The most invaluable part of the fellowship was having the ability to work with professors and peers to develop my own thesis paper. "Miami's Department of Comparative Religion is small, allowing more personal and intimate interactions with faculty. Dr. James Hanges, the chair, first got me a job in the department as a student worker, and he's been my original guide into my major. Dr. Nathan French, a specialist on Islam and jihadism, was my advisor last year for my Altman fellowship project, and he walked me through the entirety of the process of writing my fellowship thesis, which was about the 2013 Boston Marathon bombing. "I've taken a number of religion classes, and I've loved all of them. One was focused on the relationship of Judaism, Christianity, and Islam. It was the most impactful because it was when I became really interested in Islam—it was something I didn't understand, and I'm a very curious person! After investigating it further I found it to be a really fascinating, diverse, and complex religion, and I wanted to continue studying it. That led me to start taking Arabic, and I basically fell in love with everything right there. "I took another religion class last year about how Islamic law and American law mesh together. Dr. French does a really good job at making you think in ways that you haven't before. We studied how in America our past religious convictions led to our Constitution and how religious beliefs in Islam came out in Islamic law. It was interesting to study the similarities that can be drawn between Islamic law and Constitutional law. We also looked at the changing reactions in American law to the presence of Muslims. "As a very social justice-oriented person, I tend to latch on to people who I think are victims, such as many of those in the Arab-American community. 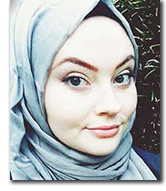 The misinformation about Islam definitely played a part in leading me to study it, and it will probably continue to play a part in what I choose to do." 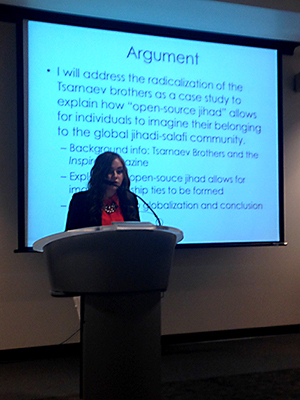 Courtney DeHaas presents her thesis arguments. "The variety of subjects that I had to complete for the Miami Plan have made a big difference in my academic and personal development. Receiving the Altman Fellowship from the Humanities Center really did a lot for me. It was the first time I had to seriously buckle down and create a really large project, and it turned out that some of my more random classes really mattered. For example, I took a microbiology class about disease, and somehow I really fell in love with learning about health and nutrition. I'm still interested in these topics, so I took another food management course and a weightlifting class. Another example is my ecology class, which focused on the environment, populations, and resources and made me care about sustainability. This class still informs my day-to-day actions and has shaped my worldview. "The variety of classes I've taken have allowed me to discover new passions. I think what's so great about Miami is that a liberal arts education is required even for business majors—globally-focused courses about religion and history and philosophy are all necessary information in and of themselves. Even if you don't retain the information, a liberal arts education will still help you learn how to read and write better and expand your knowledge beyond your comfort zone. I believe that education should be less about learning a set amount of knowledge and more about learning how to learn. The global climate, technology, and society are all changing rapidly, and we need to be prepared to change with them!" "I went to Jordan for 9 weeks last summer to study Arabic through the Summer Intensive Arabic Program with AMIDEAST, an American educational organization with locations all across the Middle East. This was possibly the best experience of my life! Right now there aren't many secure, stable countries in the region, but Jordan is an exception. I chose Jordan primarily because of the security and because my Arabic instructor, Mr. Saleh Yousef, is from there and taught me the dialect from that region. With the knowledge I had acquired here at Miami I was confident that I would be successful. Mr. Yousef also gave me a lot of important cultural information so I could prepare for the trip. I didn't realize how invaluable his advice was until I got to Jordan and felt more prepared than many of the students around me. "In Jordan, I took intensive Arabic classes for credit for 6 hours a day, 5 days a week. It was a lot of work, more work than I've ever been exposed to in my life. I did formal written Arabic for 5 hours a day and then Jordanian Arabic for 1 hour a day. Written and spoken Arabic are different, so people say that when you learn Arabic you're basically learning 2 different languages. However, if you want to learn all the dialects you have to learn at least 6 languages! Everywhere you go there are various dialects depending on what region you're in. For example, when you're in the cities of Jordan people speak one dialect, but once you travel to the more rural areas they speak another. "I had culture shock when I first arrived to Jordan. I was really excited about this new, different place, and then a week in I thought, 'Oh my god, this is hard, I can't live here, I don't understand anything anyone says, and I can't get around.' Once I got past that, I loved it and just ate up every little thing. Studying abroad brought me a lot of confidence. I was thrown into a new environment without a full grasp of the language, but I was able to get around even on my own. "We went on a number of excursions, including to Petra (an ancient city carved into a mountain), Aqaba (an old coastal city with many resorts and tourist attractions), and the Dead Sea. The water in the Dead Sea is so dense that you can feel the salt, and all you can do is float in it. It's also murky and hot like bath water, and if it gets in your eyes it really burns! You just float there on your back and avoid turning over. And even though it's deep, you can't really swim. "I often found myself lost on a street unaware of which direction to go to get where I wanted to be, and without GPS you have to ask for help. When I did that I received more help than I could have imagined. In Jordan, nothing happens on time and nothing happens the way you expect it to. I learned from studying abroad that it's important to be flexible about your plans and expectations. "What I like about Jordan and the Middle East in general is the people. Family is essential to life, and everyone does everything as a family. There are big families living close together, and it's considered sad if you don't live close enough to see your family often. I felt they interact with each other in a way you don't often see families interacting here. I lived with a host family who were very hospitable to me and included me in their activities like I was one of them. "The population of Jordan is predominantly Muslim, but depending on which part of the country you're in, it may not be as conservative as people often think. A lot of women in Jordan don't cover up as much as some Americans expect—you'll even see some wearing tank tops and short dresses and heels and everything, especially in the evening. In general, however, people are always slightly more dressed up than what I've seen here in the Midwest. Wearing things like sweatpants in public would make people in Jordan think you don't care about your appearance. How you dress there is all about how much attention you want to get, so the more you can blend in the less attention you'll receive. I found it was important to be able to adapt to a different environment with different societal norms and expectations." "If you're undecided about your major in the College of Arts and Science, you should take a couple courses in subjects you're interested in—you'll be surprised at how much you'll get from them. 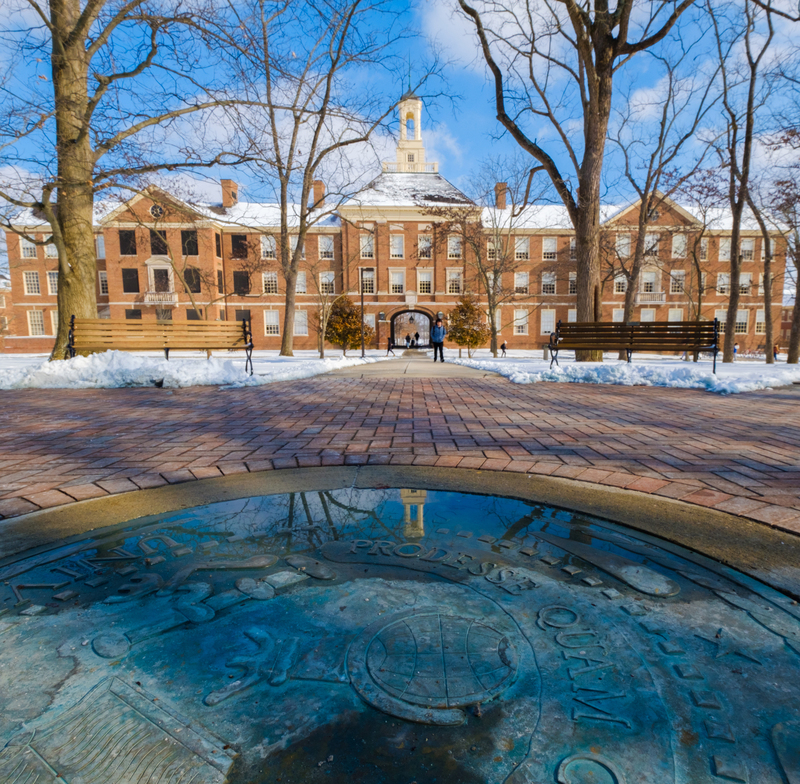 Don't rule out liberal arts education as a good plan for your future. Companies need people to think outside the box. For example, one of the most desired majors to get into law school is Latin, and not a lot of people who want to go to law school think about Latin as an option. You don't need to just be pre-med. A lot of medical schools and law schools want someone more well-rounded and who has demonstrated that they know how to learn. "I also recommend studying abroad to everyone—it's really a life-changing experience. It's kind of the norm at Miami, since a lot of students at this school have the money to do it. Although I didn't, I made it work, so anyone can. Meet with a study abroad and financial aid advisor—I think the only reason that my Gilman Scholarship application was so good is because I asked them to look over my essays before I submitted them! "As for where to go, I'd suggest choosing a country that is not European. Don't just go to Luxembourg, England, or Australia, because you'll simply be moving from one Western culture to another and not really getting the experience of what it's like to be in a truly different culture. One of the things that I appreciated most from my Jordan trip was understanding what it's like to be a foreigner. I don't think you really can know that in any western European country. I was thrown into an area where I didn't understand anything, everyone looked at me funny, and I didn't understand the cultural norms to any degree. I often felt lost wandering around someone else's country, and now I can feel for any immigrant who comes to the United States. I have a deeper appreciation of what it means to be a foreigner. "I just graduated in December of 2014, and I'm set to work with Teach for America starting this year. I'll be teaching in San Jose, California and consider this to be my first step into non-profit work. After working with Teach for America I plan to work for a non-profit that deals with American-Islamic relations and later start my own non-profit organization built around the principal of religious equality and tolerance. "My worldview has been reshaped by my experiences at Miami and in Jordan. I have discovered that at the core of myself is someone who wants to make a positive impact on this world, even if it's a small one. I could have just gotten a job in computer technology after high school and would have had a steady job for the rest of my life—but I would've never really known what I was capable of. To quote the popular Miami slogan, 'To think in such a place, I led such a life!'"